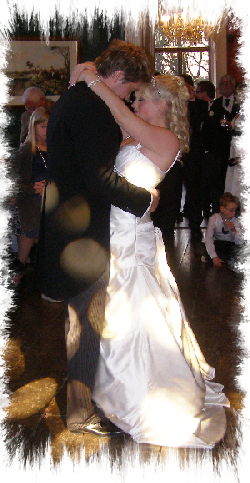 JMF Disco provides experienced Wedding DJs in Lingfield to help with your special day. JMF Disco is run by expert Wedding DJ John Padmore, who will ensure your wedding is as you wish, and the great personal service offered to you exceeds your expectations. Our aim is to provide you with all the help you need, from your initial phone call to seeing your happy guests leaving after a wonderful nights wedding entertainment, at your perfect reception provided by your Wedding DJ Lingfield. JMF Disco's Wedding DJs hire service will provide you with the entertainment you want for your dream wedding reception - why settle for anything less? Call or email JMF Disco for your Wedding Disco in Lingfield to find out how I can help you. Have a look at the Weddings page for more details of the Wedding DJ Lingfield service I offer and call me to discuss how I can help make your evening very special. I like to provide my clients with that little bit more - I provide them with what they want, need and deserve for their reception - it is a special occasion and should be treated as such. Doing it right requires a Wedding DJ with the right skills and resources. Our Wedding DJs will bring that to wedding receptions in Lingfield, playing your favourite music from your planned wedding dj playlist. Contact John on Tel 01795 429777, Mobile 07895 546183 or by email to discuss your discuss your plans, find out how we can help you with more than just music and provide you with a great Wedding DJ cost. - I'm sure I can provide you with the Wedding DJ in Lingfield you really want!